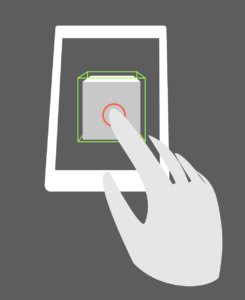 The Touch condition can define two different interaction modes: one for VR, and another one for AR. Select the details for each below. In VR, what we call the Touch condition is when the user points at an object with a controller and pulls the trigger. It can be compared to a distant selection. In order for this condition to work, you have to make sure your object has the Touch manipulation mode enabled (if needed, see section Manipulation Modes). At the root of the IO, you can choose the mode you want as well as to specify the distance between the user and the IO for the condition to be detected. Note that Manipulation Mode and distance can both be modified at runtime with a specific action. The concerned IO if you want a different one (by default, it is the root of the interaction). Anywhere: the condition will be valid no matter where the user touches the screen.